Fig. 94 Installing the seat: bolts Ⓐ, locking levers Ⓑ and retaining bars Ⓒ. Place the seat with the retaining bars on the bolts Ⓐ. 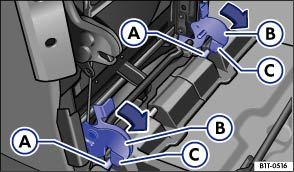 Pull both locking levers in the direction of the arrow . Pull the seat upwards to check that the catches are securely engaged . Pull the loop on the side of the seat and fold the backrest back until it clicks into place. OR: Pull the loop on the back of the seat in the direction of the arrow and fold the backrest back until it clicks into place. Adjust the head restraint . 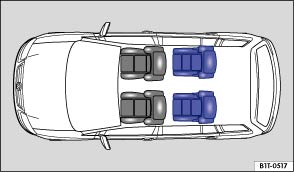 If the middle seat of the second row of seats has been removed, you can move the two outer seats in towards the vehicle centre by using anchoring points one step closer to the vehicle centre.